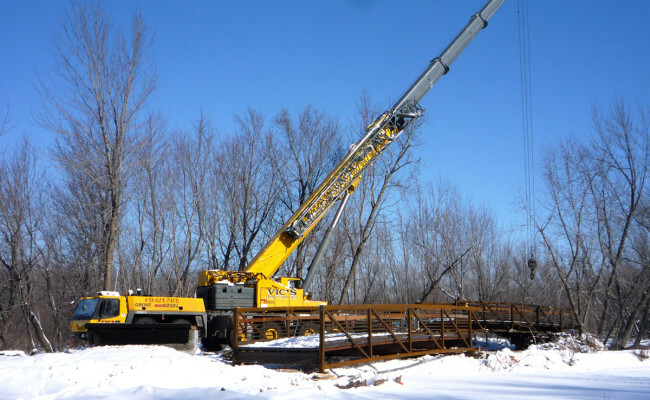 Sand Creek Bridge Replacement - ERICKSON BUILDERS & CO. INC. Sand Creek Bridge Replacement, U S Fish & Wildlife Service. 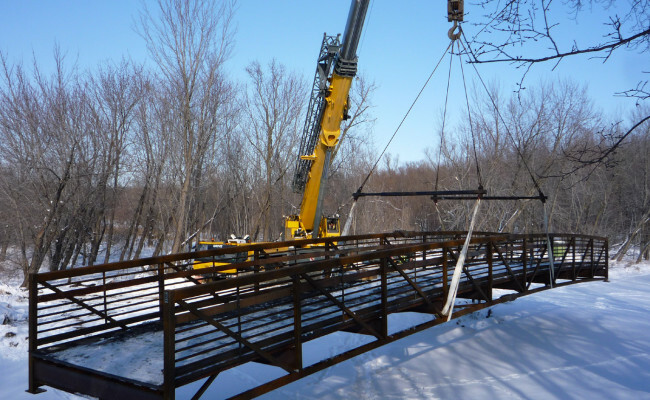 EBCI installed a new pre-engineered bridge, approximately 90 feet in length at the Louisville Swamp Unit of the Minnesota Valley National Wildlife Refuge, located in Shakopee, MN. This work includes demolition of an existing bridge, excavation, concrete abutments, a steel and timber pre-engineered bridge, gravel approach paths, and riprap protection. Erickson Builders & Co Inc. was contracted to install a pedestrian bridge that was washed out in 2004. The work was done in the winter months and we were able to adapt well to the weather conditions of October, November, December, January and February.